The referee might miss an occasional handball, but a soccer game isn’t rigged in favor of one group of players over another. Unlike a soccer game, the most powerful economic actors have rigged the labor market against everyday hardworking Americans. The weak economy following the Great Recession and its aftermath came on the heels of three decades of the systematic reduction of workers bargaining power in the workplace. It’s no surprise then that this morning’s Job Openings and Labor Turnover Survey (JOLTS) report shows that the quits rate remains depressed as workers continue to be stuck in jobs that they would leave if they could. 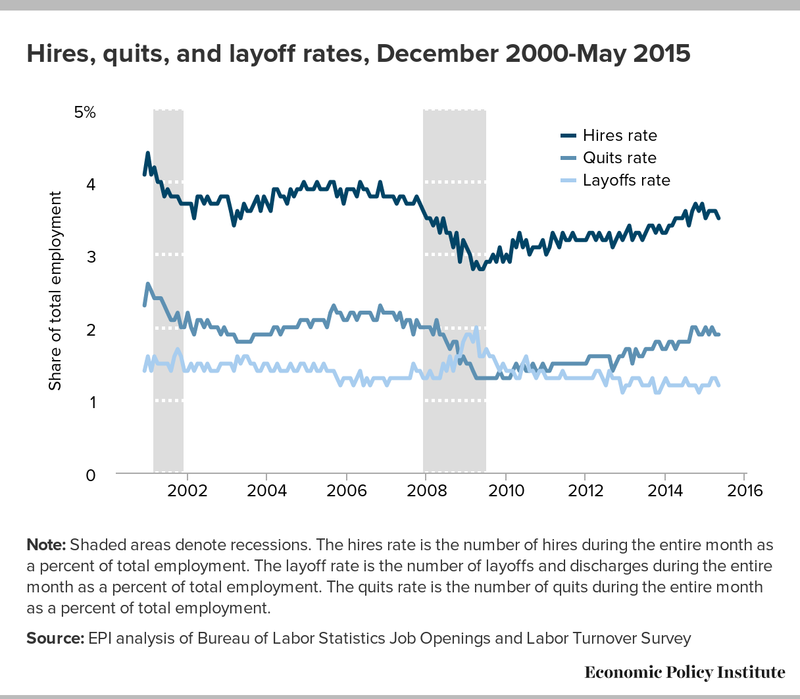 The figure below shows the hires, quits, and layoff rates through May 2015. The layoff rate shot up during the recession but recovered quickly and has been at pre-recession levels for more than three years. The fact that this trend continued in May is a good sign. That said, not only do layoffs need to come down before we see a full recovery in the labor market, but hiring also needs to pick up–the hires rate dipped slightly in May, and is still below where it was at the end of 2014. It had been generally improving, but has shown concerning signs as of late and still remains significantly below its pre-recession level. The voluntary quits rate held steady at 1.9 percent in May, where it has sat for most of the last six months. In May, the quits rate was still 9.2 percent lower than it was in 2007, before the recession began. A larger number of people voluntarily quitting their jobs indicates a strong labor market–one in which workers are able to leave jobs that are not right for them and find new ones. Before long, we should look for a return to pre-recession levels of voluntary quits, which would mean that fewer workers are locked into jobs they would leave if they could. But, as with previous months, we are not there yet. Evidence in today’s release corroborate last week’s jobs report, which continued to provide evidence that the economy is only at a slow jog, with meager wage growth and a falling labor force. 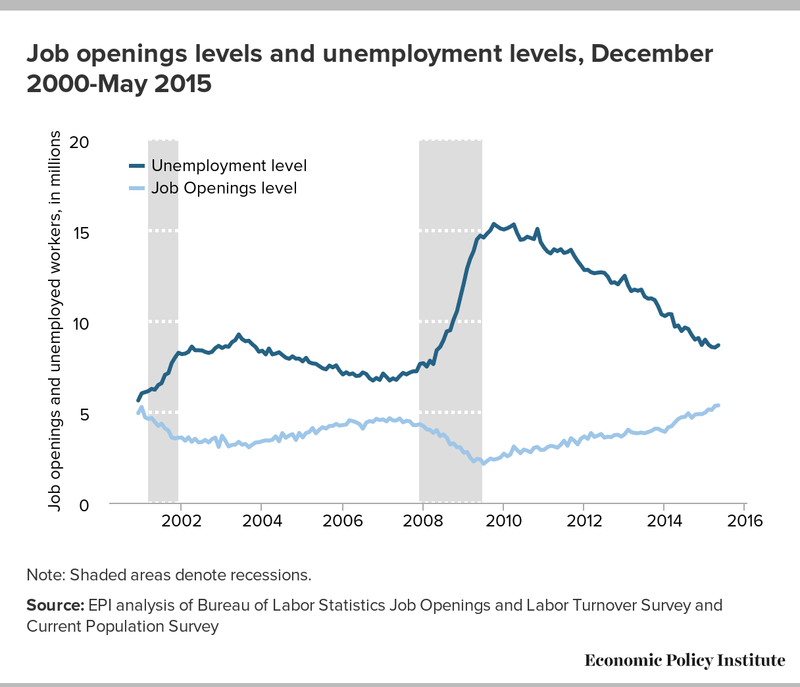 There continues to be a significant gap between the number of job seekers and the number of job openings. The figure below illustrates the overall improvement in the economy over the last five years as the unemployment level continues to fall and job openings rise. A tighter economy (like the one shown in the initial year of data) would have these levels much closer together. It’s clear that there remains significant slack in the economy. Furthermore, on top of the 8+ million unemployed workers warming the bench, there are still about three million workers sitting in the stands with little hope to even get in the game. While the topline numbers indicate that there are still 16 job seekers for every 10 job openings, there are some differences in labor market activity across sectors. There appears to be a continued tightening in the healthcare and social assistance sector–not surprising given their steady employment gains. At the other end of the spectrum, we find nearly 50 unemployed construction job seekers for every 10 construction job openings, something to consider as Congress begins to debate highway funding. A strong labor market is one in which every worker has a good chance to join in and play a fair game. As both this week’s JOLTS and last week’s jobs reports show, however, the referees are still pulling the strings to keep workers sidelined without decent paying jobs, or jobs at all, while those few at the top reap the benefits.